How one family-owned private game reserve in South Africa competes in a market already awash with choices by being ethical, sustainable and community-minded. ‘Tourism is conservation,’ insists Jacques Smit, Marketing Director of Sabi Sabi, one of southern Africa’s most popular game reserves. If it sounds like a simple foundation stone upon which to build a successful business, it’s far from it. It has taken the Loon family, which owns Sabi Sabi, 40 years to build it into a viable business, given that in recent years Africa has capitalised on the growing popularity of safaris. It’s a congested market and tourists’ need to identify the right safari has thrown up a glut of high-end experts to navigate through the bewildering and often overwhelming choices between game reserves, national parks or concessions. Rural South Africa is rich in natural beauty and low on population so it has built an international reputation for having some of the most untouched wilderness in the world. The issue is how to choose between all the game reserves, many that have sprung up recently, in the southern part of the continent. The name Sabi Sabi derives from the word ‘tsave’, meaning fear or danger in the Tsonga dialect. This stems from the large numbers of crocodile and hippo in the Sabie River. 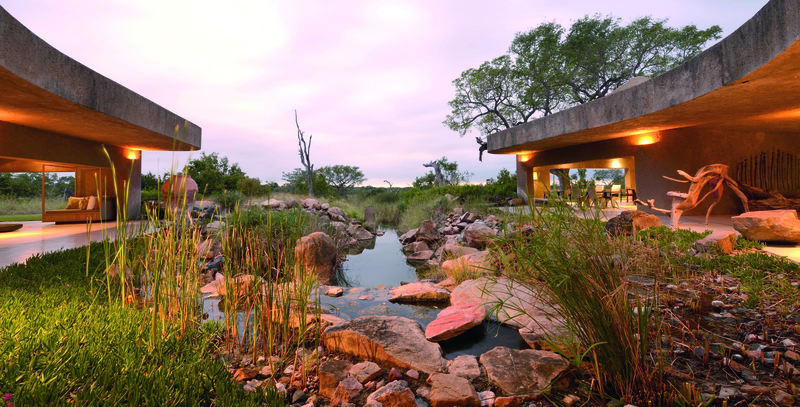 Sabi Sabi is ecologically and geographically integrated with Kruger National Park and situated within Sabi Sand Wildtuin, one of the oldest and largest private reserves in Africa. The diverse and pristine habitat is home to wildlife including the mandatory ‘Big Five’ for healthy tourism – lion, leopard, rhino, buffalo and elephant – as well as cheetah, wild dog and some 200 other indigenous species. It’s also home to 350 species of birds. Prince Alfonso of Hohenlohe- Langenburg, who founded the iconic Marbella Club in Spain in the 1950s, once described luxury as ‘privacy in a garden’. Though he coined the phrase over 50 years ago, it’s refreshingly apt today as luxury becomes less about accumulating objects and more about experiencing nature with a clear conscience and finding room to breathe. Surrounded by 6,500 hectares of game reserve, Sabi Sabi is arguably the ultimate luxury offering. It comprises four lodges, each with its own unique design and feel: Earth Lodge, Selati Camp, Bush Lodge and Little Bush Camp, which are all members of the National Geographic Unique Lodges of the World programme. The lodges are audited every year to ensure their ongoing commitment to sustainability. All are unfenced, meaning the wildlife are left free to roam. Nevertheless, there are plenty of other game reserves in southern Africa that boast plentiful wildlife and beautiful lodges. I am talking to Jacques in the sleek, marbled lobby of a Mayfair hotel in London into which he brings an outdoor energy, suggesting sun, colour and wide-open spaces. The muted, monochrome elegance that surrounds us feels a constrained setting for Jacques’ vivacious accounts of the African bush. He clearly enjoys his job and believes Sabi Sabi’s success is underpinned by the stability that is only ever achieved when a business is owned, managed and staffed by people who, like him, love what they do. ‘I’m a terrible salesman,’ he laughs,‘but if I believe in something, then I love talking about it. And I’m passionate about Sabi Sabi.’ He tells me respect for the animals and concern for the environment is at the core of Sabi Sabi’s ethos and he is adamant about how the guided safaris are run at Sabi Sabi. ‘We only ever have about 22 vehicles out at any one time over a big area and we never have more than three at a sighting,’ he says. ‘If we’re watching elephant or rhino, we only allow two vehicles and when there are cubs, we’ll only bring in one – and then only when the guides are certain the mothers and cubs are comfortable. Animals never associate our vehicles with stress or fear and people comment on how relaxed the animals look. In 2006 Jacques went back home to South Africa. ‘I started feeling South Africa was moving forward without me and wanted to be part of it,’ he says. He started working for Sabi Sabi, inspired by the fact that it was still in the hands of Hilton and Jacqui Loon, who had bought it in 1979. Hilton was in finance and Jacqui was a designer and artist. ‘I still get goose bumps talking about this,’ says Jacques, ‘but conservation is really all about conserving what you have for the next generation. I’ve watched the Loons build Sabi Sabi up and then hand it on to their two sons. Earth Lodge is sculpted into a slope of earth and almost invisible in the landscape. It has 13 suites with a private plunge pool and butler service. Little Bush lies under trees on the bank of the Msuthlu River and has six thatched suites, decorated in contemporary African design, with private viewing decks overlooking the riverbed. Selati Camp is named after the abandoned railroad that runs through the eastern section of Sabi Sabi and its eight thatched suites, decorated with railway memorabilia from the 1900s and vintage finds, are redolent of colonial opulence. Bush Lodge is the biggest component of Sabi Sabi, comprising 25 air-conditioned thatched suites with huge viewing decks overlooking the plain and waterhole. It’s also home to the Elefun Centre, a kids’ club where children learn about crafts, tracking, map-reading and bushveld games. Nelson Mandela visited Bush Lodge in 1999 and during his safari with the operations manager of that time, he had a stand-off with an elephant. Photographs of that visit hang in the lodge to this day. Luxury seems a curiously inappropriate subject to move onto during a conversation about wild animals, the environment and one of the twentieth century’s most significant historical figures. Honeymoon Suite at Selati Camp, the above-and-beyond facilities for children, the cellar containing 6,000 bottles of rare wine and of course the exquisite food and the themed dinners (Under African Skies, Elegant Indulgence and Starlight Bush Dinner). ‘Of course, luxury is crucial but at the end of the day people come for the safari and our three main achievements are that our habitat is superbly managed, the animals respected and our guides are sensitive and able to interpret the animals. Beyond that guests like to feel they’re part of something. That’s what we offer and why guests come back again and again. They make lifelong friendships with staff. A couple who came here on honeymoon 20 years ago will come back with their kids and go out on safari with the same ranger. Another woman who was here last week had been here in the 1980s with her husband. Her husband had since passed away and she chose to come back to Sabi Sabi to feel close to him again. It’s the sense of belonging and being part of a family guests really love.